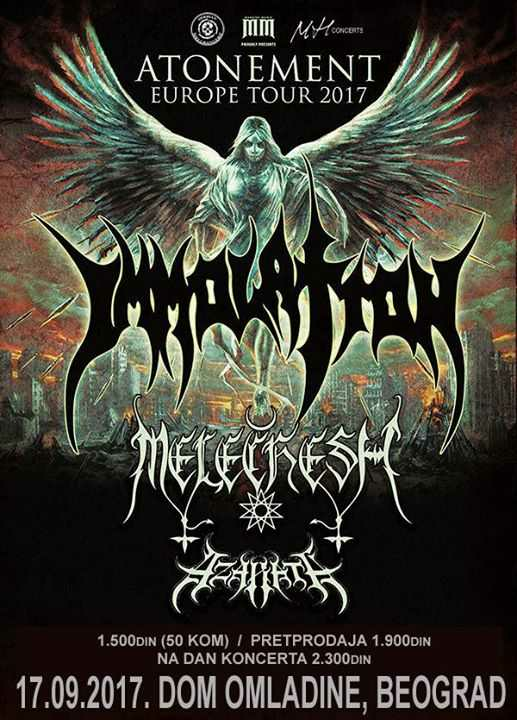 New York based legends Immolation are going to invade Serbia! After a while, these death metal pioneers are about to spew their heresy over fans in Belgrade ! The band is currently promoting their latest release Atonement which was released on February 24th via Nuclear Blast. They will be supported by a pretty awesome Eastern-sounding black metal Melechesh. The concert will be held at Dom Omladine on September 17th thanks to MH Concerts. Tickets can be bought via Eventim or in Felix shop in Belgrade & Mungos shop in Novi sad. WHOEVER MISSES THIS EVENT IS A CHRISTIAN. Ticket price: 1900 dinars; On concert day: 2300 dinars.